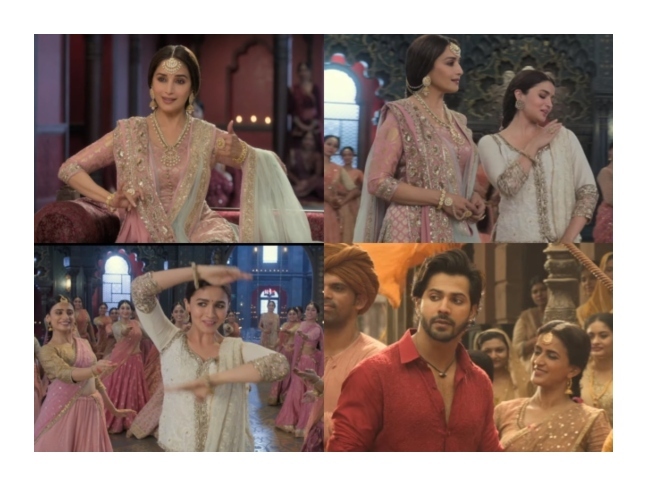 Alia Bhatt’s and Madhuri Dixit’s number Ghar More Pardesiya from Kalank is not only breathtaking for the dance moves of the actresses but also for the beautiful spectacle that it exhibits. The song has been mounted on a large scale and depicts the Hindu epic Ramayana as its background. The song is sort of a bhajan that is used by Madhuri to teach kathak to her students. Although, the song is a grand visual spectacle we got our hands on a behind-the-scenes video of the shoot of the song where we get to see how the song was mounted right from storyboard creations to actual figurines and numerous dancers. The making video gives us a glimpse of all the hard work that was put in to get the song appealing and look larger-than-life. Ghar More Pardesiya has Alia doing Kathak for the first time in her life and she was thankful that she did not have to match steps with Madhuri. The song looks like an important part of the narrative of Kalank that has an ensemble cast of Sanjay Dutt, Varun Dhawan, Aditya Roy Kapur and Sonakshi Sinha. Kalank is directed by Abhishek Varman and produced b Karan Johar and Sajid Nadiadwala. It is slated to release on April 17.